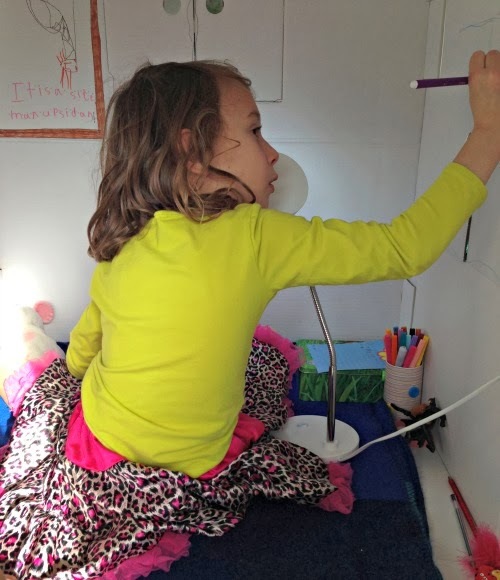 Imaginary play is definitely the number one choice for playtime at our house, and the addition of a play house has really helped to make our children's imaginary play come to life! Imaginary play is a key ingredient in growing creative kids and has huge intellectual and emotional benefits for children. 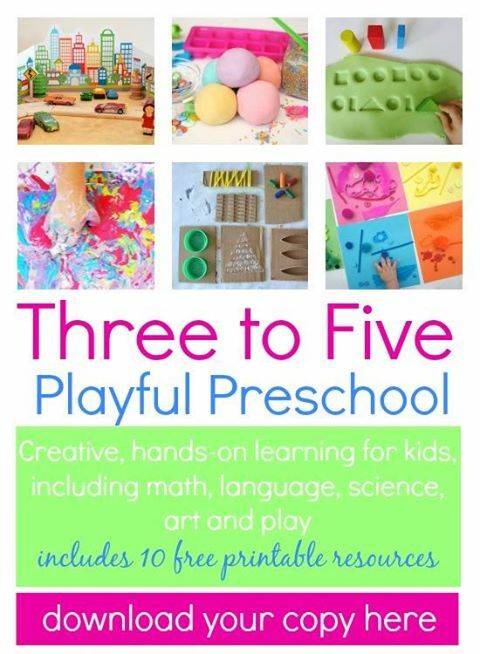 It allows them opportunities to explore hypotheses, problem-solve, role-play social situations, develop language and literacy skills, and work through emotional stresses. 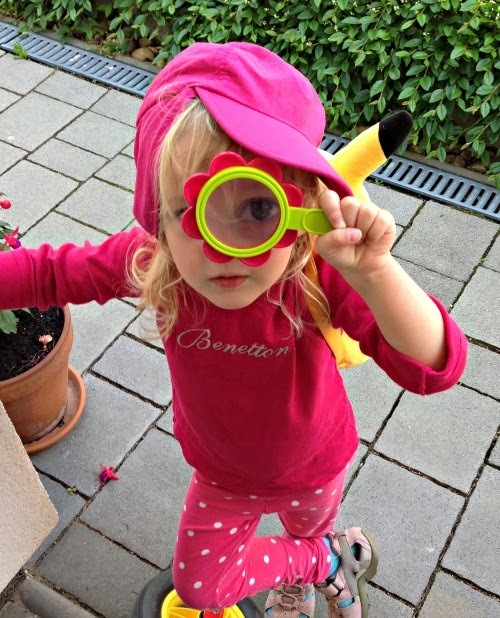 Having a play house has given our kids so many opportunities to expand their imaginary play, and having a 'life-sized' structure to play out their scenes in makes it all that much more real to them. 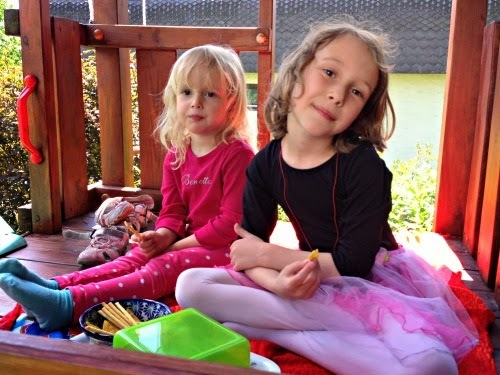 In fact, we actually have two play houses - a wooden play house outdoors and a cardboard play house [sponsored link] indoors - to support their imaginary play. 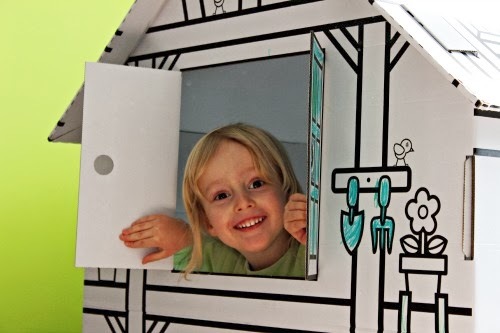 Below are some of the ways they play with their play houses and some suggestions for props. I recommend placing a basket of mixed accessories in or next to a play house and leaving the rest up to them. If your child wants to engage you in the play, follow their lead instead of trying to direct the play. 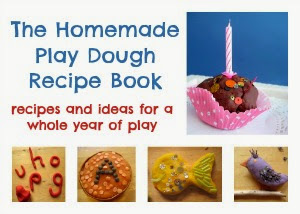 Chances are, your child has much more imaginative ideas than you could dream up! 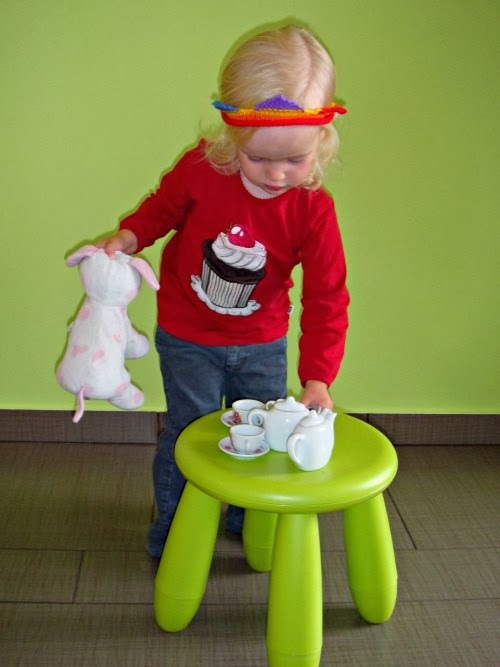 If your child needs a nudge when it comes to imaginary play, try picking up a prop and starting the ball rolling with an inviting prompt. Something like, "Oh, thank you for this lovely invitation to your tea party! What can I bring?" or, "Excuse me, Doctor, but my baby has been coughing all night. Can you help?" will likely be enough to trigger a scenario in your child's mind. *House - they play family roles, baby care, tea parties. Possible props: baby doll, tea set. *School - Possible props: paper, pencils, math manipulatives, their homework! 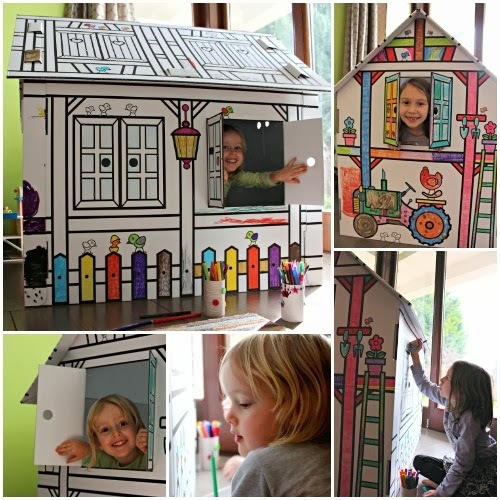 Our indoor play house is a Villa Carton XXL House [sponsored link], which is a brilliant creation - a cardboard house that comes flat and pre-printed in black and white to look like a country farmhouse that you put together and let your kids colour/decorate themselves! 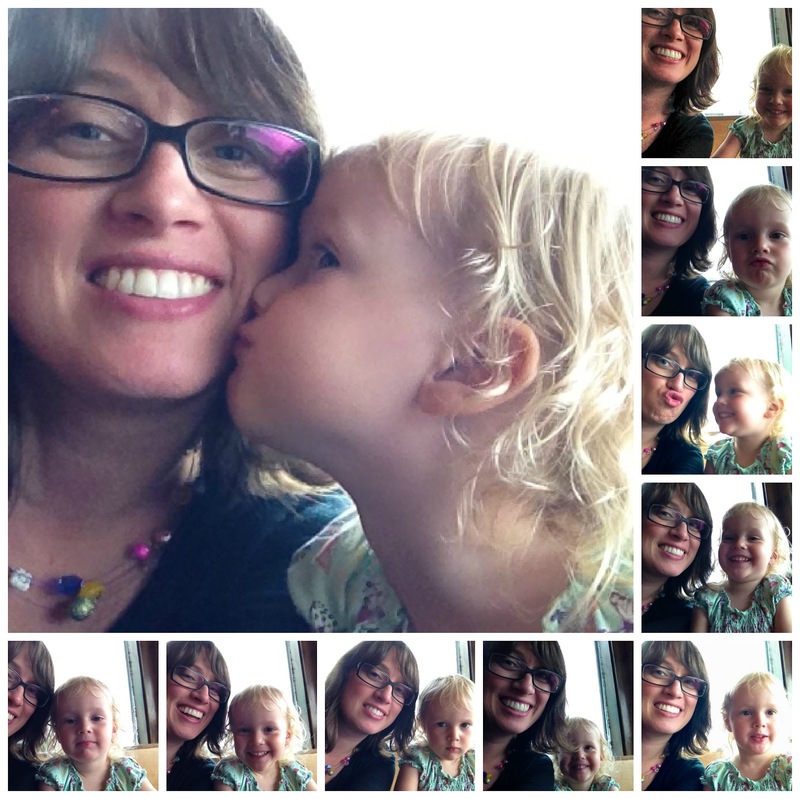 My girls (and I) LOVE Villa Carton products (you can see our review of the Villa Carton City Blocks here). 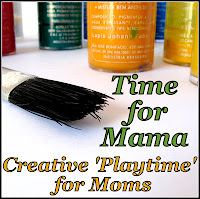 They are the perfect combination of creativity and imaginary play. And while it would be possible to make your own cardboard box house out of a regular box, my girls love the 'real house' look of the Villa Carton house (and Daddy Pea much prefers it to having a regular cardboard box in the living room!) To colour it, they used a mix of paint, markers, and crayons (they especially enjoyed colour-mixing to make brown paint and using it to paint 'mud' on the tractor!) They added their artwork in frames that they painted on the inside walls. You could also make pretty paper frames with an open top to change out the artwork. They strung up some sweet star-shaped fairy lights inside, and have kitted it out with a cosy blanket on the floor. As you can see in the pictures, the colouring and decorating are ongoing (which is one of the things I love about it - both the creating and the play go on and on!) Our next project will be to make some paper bunting to add to it. For more pictures of how my girls created and decorated their play house, click here.